Grossissement : x4 Coloration : H.E.S. SOLCIA E, CAPELLA C, KLÃ–PPEL G. Tumors of the panceas . 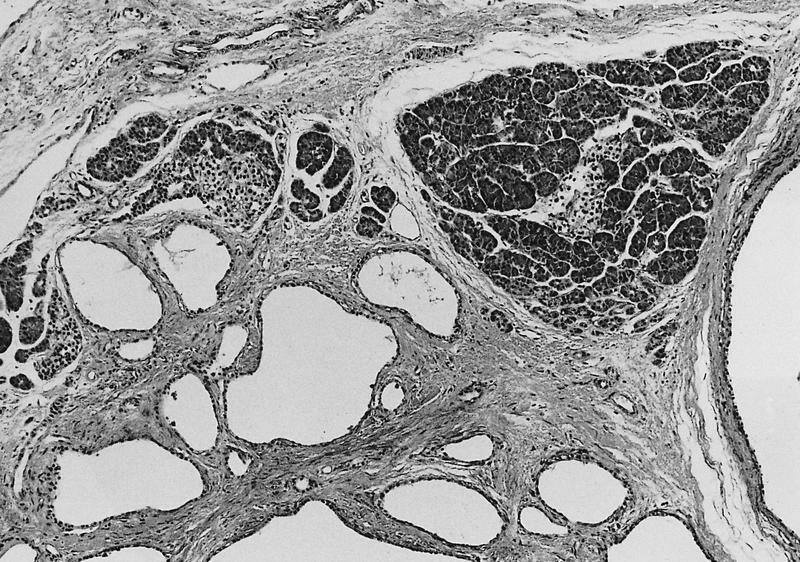 Atlas of tumor pathology. Third series Fascicle 20. Armed forces institute of pathology. Washington 1997:215-37. (1) Rosai J. Pancreas and ampullary region. In : Rosai J, editor. Ackerman’s surgical pathology. StLouis : Mosby, 1996 : 969-1013. (7) Solcia E, Capella C, Kloppel G. Tumors of the exocrine pancreas. In : Rosai J, Sobin LH, editors. Tumors of the pancreas. Washington : Armed forces institute of pathology, 1997 : 31-144. (18) Hammel PR, Vilgrain V, Terris B, Penfornis A, Sauvanet A, Correas JM et al. Pancreatic involvement in von Hippel-Lindau disease. The Groupe Francophone d’Etude de la Maladie de von Hippel-Lindau. Gastroenterology 2000 ; 119(4):1087-95. (19) Mohr VH, Vortmeyer AO, Zhuang Z, Libutti SK, Walther MM, Choyke PL et al. Histopathology and molecular genetics of multiple cysts and microcystic (serous) adenomas of the pancreas in von Hippel-Lindau patients. Am J Pathol 2000 ; 157(5):1615-21.